Waterford County Council is holding public consultation for a 31km greenway between the seaside town of Dungarvan and Kilmeaden, south of Waterford City. 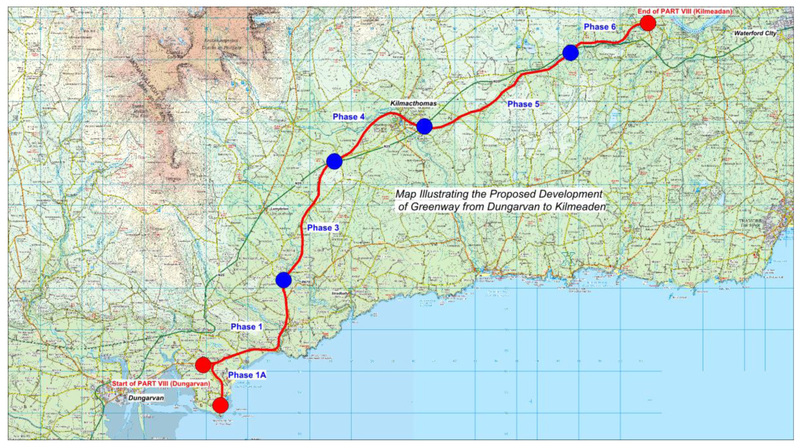 The Deise Greenway group, which is pushing for a greenway over the full Waterford-Dungarvan railway route, said the news was “another historic day in the Deise Greenway’s expansion”. The last train services ran in the early 1980s, while the tracks were taken up in 1990s. However the route has mostly stayed intact and in State ownership. The section at planning – which is due to be around 4 meters wide – includes a tunnel of 386 metres in length, 15 level crossings on the route of minor roads, 3 crossings on the N25, and 20 bridges. Most of the bridges are single arch, while there are three large structures including a near 100 meter steel bridge and two stone viaducts. Planning files for project say that the railway ballast – large gravel – remains in place for the majority of the rail line – only “removed or covered over in limited qualities where there have been unauthorised encroachments on the line”. The project will include railings at bridges and viaducts, fences to secure the route, privacy screens at houses, road improvements at level crossings, and bat-sensitive lighting in the tunnel. The Part 8 planning files can be viewed on Waterford County Council’s website or at their offices in Dungarvan and the Kilmacthomas Branch Library. See here for details. Submissions or observations are to be made before 4pm March 14, 2014. The greenway is an excellent idea. It will be a great attraction for Co. Waterford. I am sure it will be well used by the local people , as the present cycleway\walkway from Walton park out to Clonea has proved. It will also be greatly appreciated by our visitors with the stunning views of the Waterford coast and the Comeragh mountains. It will also preserve our heritage. Cannot wait until this facility is developed, will be a huge addition to our tourism offer here in Waterford. Well done to Co Co and all who have been promoting this.